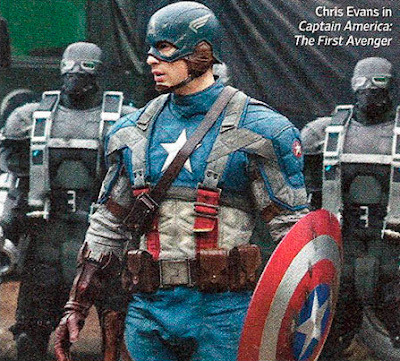 Today we get the first look at Chris Evans as Captain America, all padded up and ready for game-time. What do heroes carry in all those pouches anyway? A PSP? Mints? A copy of Making A Successful Comic Book Movie For Dummies? Only their dry-cleaner knows for sure. 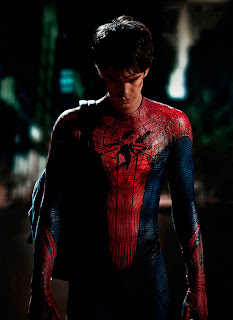 Also if that doesn't get your spider-sense tingling, we have Mr. Garfeild in his official redesigned spider-threads - complete with designer teenage angst sown in. Those face scratches wouldn't be from a Black Cat now would they? Or someone more reptilian? I've said it before but it bears repeating. I'm really loving the period WWII body armor for Cap. I even like the stenciled-on wings. It fits with the Army motif (more MASH than WWII but still). So am I Craig! I like the painted on wings to - and anything beats the rubber ears of the last ones!